I love summer colors. And (for some reason) I love random stamping. I think I find it exciting that I can make something out of nothing. When I 'random stamp' I make visual triangles. And I always start with the largest stamp image. See how the 3 pears make an invisible triangle? Make sure some of your stamped images go off the page. It just looks more random. I have a funny story. 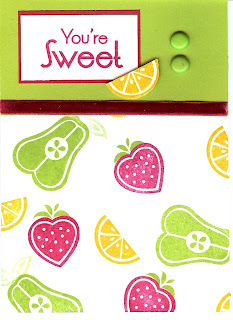 I really wanted to use the lemons in this stamp set, because I liked the brightness of the Sunny Yellow. My mother said "Lemons are sour, and your card says 'You're Sweet.' You shouldn't use the lemons." Sigh... OK... so I switched to oranges (using Sunflower ink; Sunset was too dark). Then she says, "I don't like the pears, they look like Butts." TOO BAD, I'm using the Butts. I didn't used to think they looked like butts, but after she mentioned it, that's all I could see. My mom has a really good eye as to what "works." I trust her judgement. Thanks Mom! I popped one of the oranges up with Foam Mounting Tape (my fav. ).